Created in collaboration with the Wedgworth Leadership Institute, Why I Lead is a new series of Self Narrate videos. Each Why I Lead video features different leaders working within agriculture and natural resources in the state of Florida talking about events in their lives that shaped their leadership philosophies. 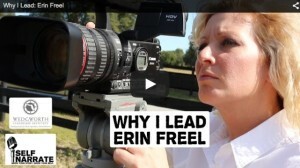 The fourth Why I Lead video features Erin Freel of The Market Place, an agricultural marketing and video production company. Erin has demonstrated her leadership skills for years as the Founder and President of The Market Place. In this video, she shares stories that show where her some of these skills come from.